Having an identity is an essential part of a satisfying life. When I was able to work, I took a great deal of pride in what I accomplished to become a physician assistant. My career enabled me to help my pediatric patients live healthier lives and I was respected by both my colleagues and patients. Once my dementia symptoms became apparent to me, although I was yet to be diagnosed with frontotemporal dementia, I stopped working so that I took no chances of harming my patients. When I stopped working there was a terrible sense of loss and I struggled with finding a new identity. Once I received my diagnosis, there was an even greater question of who I really was. My intellect had defined me for so long. Thankfully I had many hobbies and pursuing those helped immensely in establishing a new sense of self. Gradually I began to think of myself as an artist, gardener, and craftsperson. Pursuing a creative life brought meaning, satisfaction, pride, and a sense of accomplishment. My projects were admired by others and I once again felt respected. Creativity brings with it calm, happiness, and fun! Watercolor painting was something I had dabbled with for many years, but now it has taken on a new meaning for me. As part of my FTD, I began to experience aphasia. Speaking is often a struggle and someday in the future I will be mute. Expressing myself verbally is nearly impossible, but with my painting I am able to communicate my thoughts and feelings in a way that others can understand. A few years ago, I discovered an art form called Zentangle. Basically doodling, the “Zen” comes from the meditative state it evokes. 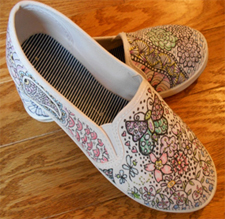 It is relaxing and fun, and I have taken to Zentangling to personalize many things. Recently, a white pair of cheap tennis shoes became a custom work of art. Fairy gardening is a fun and imaginative way to play in my garden. Planning the layout then making it come to life is very satisfying. I always have a new idea for the fairies and love to create accessories for them. This year I worked on a waterfall and stream. Ideas in the works are a lily pad and frog, a firepit, a bridge, a peacock, and a dog. This should keep me busy for awhile! * Admin issues: SHARE dementia awareness thru buttons below. If interested in receiving notice of future blog postings there is a “follow” button in the upper left corner (MS Explorer) or lower right (Safari and Chrome). Feel free to leave your thoughts in the form of comments, but please filter your comments with truthful loving kindness to all concerned. If there is an advertisement below, I have no control over what is shown. 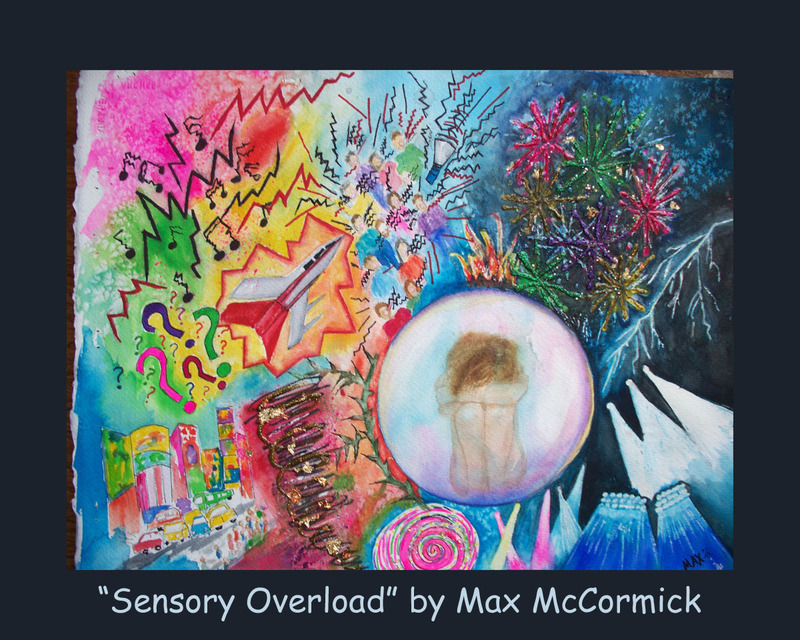 — Copyright Max McCormick on 2015-07/28.